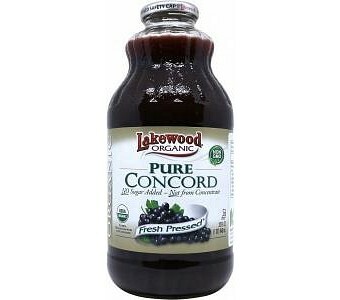 Concord Grapes are a deep purple variety of grape native to North America. They contain high levels of anti-oxident, polyphenol, which helps to fight free radicals. Research on concorde grapes has suggested that the anti-oxidents they contain help to reduce inflammation associated with heart disease. Containing naturally occuring potassium, essential micro-nutrients and Vitamin C, this healthy, refreshing blend contains no synthetically compounded fertilisers, pesticides, herbicides or growth regulators, and is pressed, bottled and vacuum sealed in certified organic facilities.